Want to be special in the eyes of someone at the animal rescue? Can't adopt them all, maybe not even one but want to help and you know they can help you. 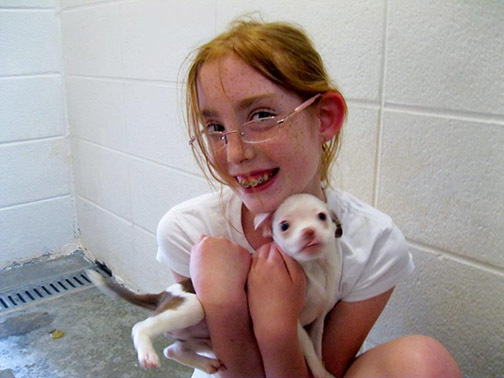 Become a volunteer and help the shelter pets get adopted. Everyday we need help walking the dogs and grooming the cats. Most of all, our animals need the touch of a a human hand, comforting words, and playtime. You can help with fundraisers, adoption days, or rabies clinics. Maybe you could transport pets. Are you handy with tools or computers? Rakes or plants? We've got a place for you. Are you willing to help during emergencies in the county? None of the above? Talk to us about the skills you could offer. We offer volunteer training and are happy to give you a tour of the shelter and more information. Volunteers are welcome during operating hours. Volunteers must be over 16 or accompanied by an adult. Our volunteers are priceless. They are paid in tail-wags and kitty purrs for a job well done! Download a copy of our Volunteer Guidelines and/or a Volunteer Application. Bring your completed application in person to Mitchell County Animal Rescue, 2492 U.S. Route 19E, Spruce Pine, NC.